The Palmyra is located in the Mountain Village core. 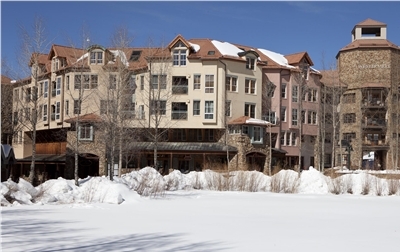 These units are convienently located near Lift #4, Village Express, and the Gondola and just steps away from the eventful Telluride Conference Center. Some units may have private balconies with views of Mt. Wilson and the ski area. The Palmyra Condos are known for their great location right in the Mountain Village core, and Palmyra 3H delivers. This one-bedroom Palmyra condo is located on the third floor and is accessed by an interior hallway and elevator. Upon entering the condo, there is a bedroom and bathroom on your left, and a large, open living space down the hall. The living room has beautiful ceiling beams, a queen sleeper sofa, flat-screen TV with a DVD player and a PlayStation 2 (bring your own games). 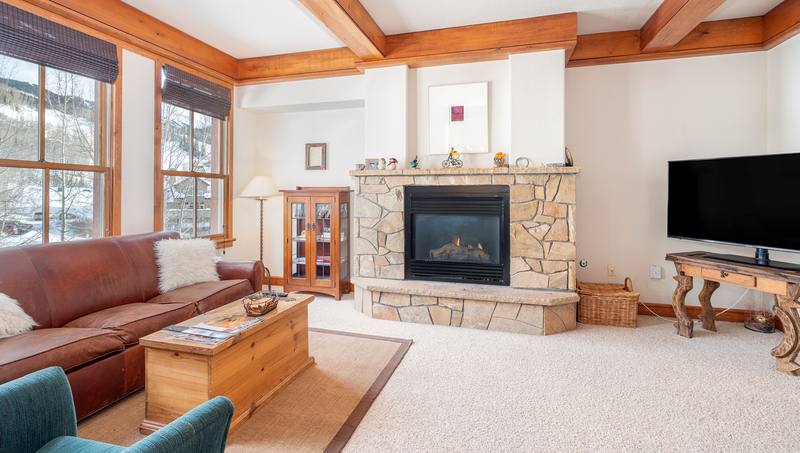 A gas fireplace is the focal point of the room, giving the space a cozy feel, despite the size. A small private balcony is located off the living room and has views of the Mountain Village core and surrounding mountains. A dining room and kitchen are located off of the living space. The dining room has seating for four, but there are two additional stools at the kitchen's breakfast bar. The kitchen has everything you'd need to cook - a stove, oven, microwave, and toaster, but the refrigerator is half-sized. Please be aware of the size when purchasing groceries for your stay. The bedroom is quite spacious and has a king bed, flat-screen TV and views of the mountains from the windows. A jack-and-jill bathroom is connected to the bedroom, as well as the hallway. The bathroom has a large vanity area and sink as well as a separate room with a shower/tub combo and a toilet. Private laundry is located off the hallway. Palmyra is located right in the Mountain Village core, just steps from ski access, the gondola station and restaurants and shops. 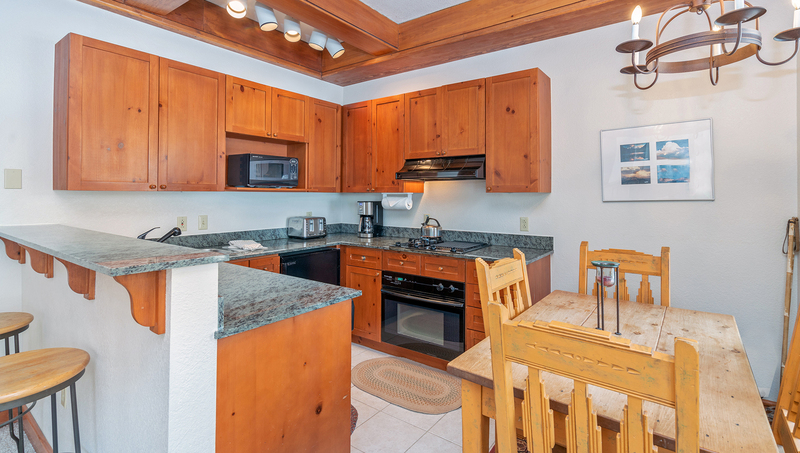 All condos have a private ski locker in the entry hallway at street level. Please note that this unit does not come with parking. Parking in Mountain Village starts at $25 per night on a first-come, first-served basis. 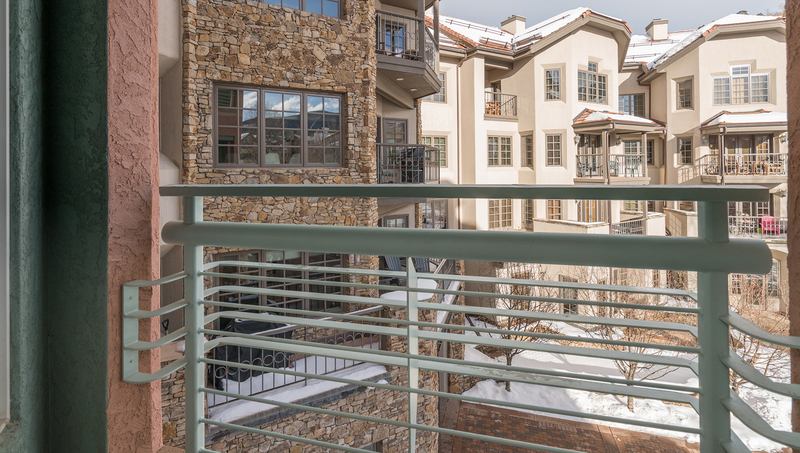 The Palmyra Condos are known for their great location right in the Mountain Village core, and this unit is no different! 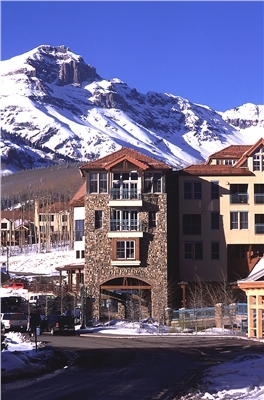 Palmyra 4E is a great spot for a couples' retreat to Telluride. This one-bedroom condo is located on the fourth floor of the Palmyra building and is accessed by an interior hallway and elevator. Upon entering this residence, you are welcomed into a full kitchen with granite countertops and newer black appliances. While it is a full kitchen, the refrigerator is half-sized. The kitchen is open to the dining room, which has seating for four at the table. 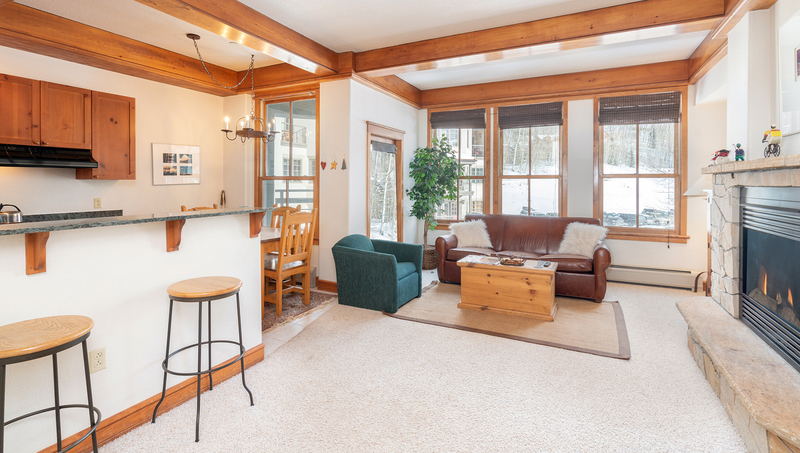 The condo continues into the living room, which has a sofa, recliner, flat-screen TV with a DVD/VCR, stereo, gas fireplace and stunning views of the Mountain Village core and ski area. It's a great spot to cuddle up next to the fire after a day on the slopes! The bedroom is spacious and has a queen bed and a window with views of the ski area and surrounding mountains. A bathroom is located outside the bedroom in the hallway and has a vanity room with a large counter space and a second room with a shower/tub combination. Palmyra is located right in the Mountain Village core, just steps from ski access, the gondola station and restaurants and shops. 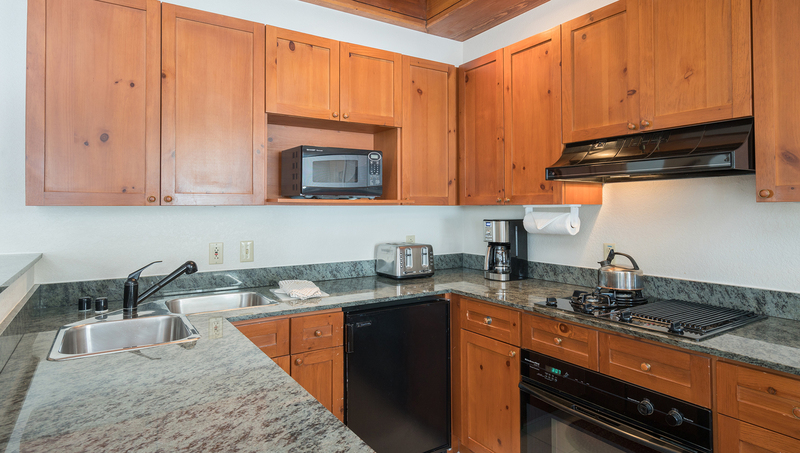 All condos have a private ski locker in the entry hallway at street level. This condo has a designated parking spot for one vehicle in the Palmyra garage downstairs, spot #4E. Please be aware that the maximum occupancy on this condo is two people.